I wish to extend my heartfelt welcome to His Excellency President Tony Tan Keng Yam and Her Excellency Mrs. Mary Tan of the Republic of Singapore on the occasion of Your State Visit to Japan in this commemorative year marking the 50th anniversary of the establishment of diplomatic relations between our two countries. It is my great pleasure to be able to spend this evening together with You. It was 46 years ago, in 1970, that the Empress and I first visited Singapore. We were honoured at that time to meet with then President Yusof bin Ishak and Mrs. Toh Puan Noor Aishah, and to be invited to a banquet hosted by then Prime Minister Lee Kuan Yew and Mrs. Kwa Geok Choo. We visited Singapore again in 1981 and in 2006 as State Guests, when we commemorated the 40th anniversary of diplomatic relations between our two nations. We then received warm hospitality from then President S. R. Nathan and Mrs. Urmila Nandey, Prime Minister Lee Hsien Loong and Mrs. Ho Ching, and many other people of your country. At the time of our first visit, Singapore was still in its early days, having gained its independence just five years before, and setting out on its course of nation-building. Every time we visited Singapore since then, we witnessed the dramatic progress that you had made in the intervening years. Now, more than half a century since Singapore’s independence, you have succeeded in creating a beautiful, affluent nation. It pleases me greatly to note that your national development has been accompanied by similarly striking advances in the bilateral relations between our two countries. We are happy that Japan-Singapore relations have grown firm and strong, just like the Japanese cycad seedlings the Empress and I planted in the Japanese garden in the Jurong district on our first visit to Singapore those many years ago. Recent years have seen the passing of great figures from Singapore’s history: former Prime Minister Lee Kuan Yew in March 2015 and former President Nathan in August of this year. 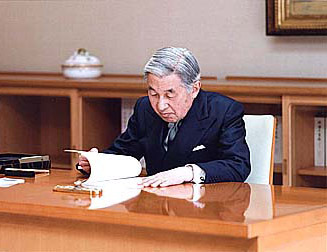 I would like to express my deepest condolences once again for the loss of those two figures who led Singapore in its early years soon after its independence and greatly contributed to the fostering of friendly and cooperative ties with Japan. Your Excellencies President Tan and Mrs. Mary Tan, I understand that, as part of your visit to Japan this time, you will be visiting the town of Shichigahama in Miyagi Prefecture, which suffered great damage in the Great East Japan Earthquake and subsequent tsunami of March 2011. When this disaster struck five and a half years ago, Singapore provided valuable aid to Japan, such as sending emergency supplies and dispatching a search and rescue team. Thanks to the generous donations from Singapore, various recovery projects were implemented in Shichigahama and other areas impacted by the disaster. I wish to express my deepest gratitude to the people and Government of Singapore for the warm support they offered us in our time of need. In 1966, the year after Singapore’s independence, Japan established diplomatic relations with your country. In the 50 years since then, our two nations have maintained and developed a close, friendly, and cooperative relationship. At the same time, I believe that we must never forget the many precious lives that were lost in Singapore during World War II, and the many hardships suffered by the Singaporean people during that time. Last year, the Japanese Association, Singapore, celebrated the 100th anniversary of its foundation. Today nearly 40,000 Japanese citizens make Singapore their home, being active not just within Singapore but throughout the neighbouring countries in the region, using Singapore as their base. The ties between Japan and Singapore go well beyond political and economic ones to encompass a broad range of fields, including cultural and intellectual exchange. With the cooperation of the Singaporean authorities, there is a center operating to share Japanese culture with the people of Singapore, further promoting the cultural exchange between us. Our two nations have also been working together to help ensure the peace and prosperity of our region and the world. Since 1994, for instance, Japan and Singapore have engaged in various forms of technical cooperation, including accepting trainees from third countries. To date, more than 6,000 trainees from some 90 nations have benefitted from this assistance. Here in Japan, we are now nearing the end of autumn and entering the winter season. Your Excellencies President Tan and Mrs. Tan, I am told that you will be visiting Kyoto as well as the Tohoku region of Japan. I sincerely hope that your visit will be a memorable and fruitful one which will help to further deepen the mutual understanding and friendly cooperative relations between Japan and Singapore towards the next half-century. I would now like to propose a toast to the good health of Your Excellencies, and to the happiness of the people of Singapore.